I feel that in this last year I’ve lived most of my life in ancient Egypt. See, after playing over 90 hours of Assassin’s Creed Origins and now delving into the fascinating world of the comic spinoffs, it’s turned out to be a rather brilliant place to spend a lot of time in… except for the murders, assassinations and political turmoil of course. 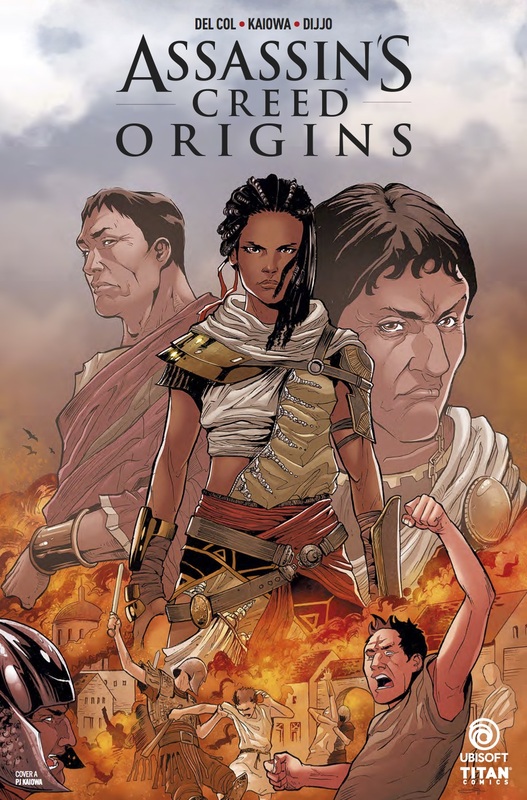 Now that Issue Two of the Titan Comics’ Assassin’s Creed Origins series is here I’m back into the world of Aya and her time once more. But does the series keep up the very high standards of the first episode? I loved the first issue with its sharp and intelligent writing totally encapsulating the political and social elements of the time, as well as questioning Aya’s motives and ethics. The artwork, colouring, and use of frames were exciting to behold and the action was fast and furious. In this one though, we again start in the court of Cleopatra who is found teaching her son a very hard lesson. A fire in the distance reminds her of when Caesar was killed and a very different kind of fire burned in Rome. Cut back to Aya and three hours after the death of Caesar and Rome is in turmoil, with the fear and repercussions flowing out onto the streets. Aya watches from above in confusion and doubts that her actions have helped the city. She saves a few people and a dog, then escapes an attack from an angry mob. Taken in protection by the exiled Brutus and fellow conspirators Aya makes a vow to defend the people of the city and so heads back into the action. The story still has the edge of the first episode. 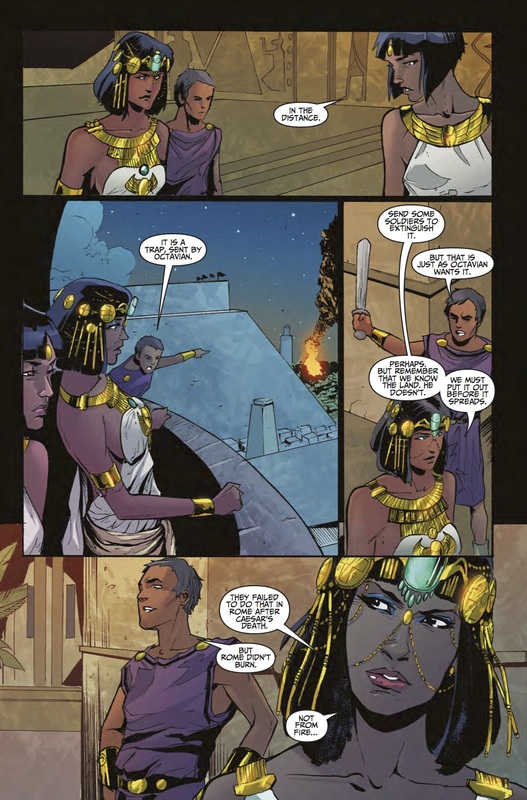 I like the framing of Cleopatra being the narrator and telling the tale, as well as the superb mixture of political dialogue/social disorder with sharp lines and well-rounded characters. The journey of Aya is one that is as interesting as the character and the cliffhanger that she ends up in is a pleasing one. I am curious as to where the story will go next in this series, but do feel that we are in safe hands with this team of writers and creatives. The visuals and artwork design are of a very high standard once again. 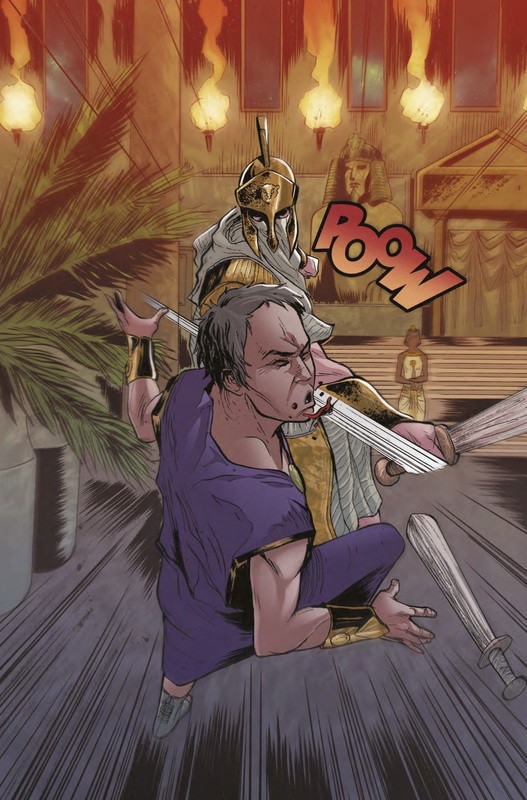 The action sequences come alive off the page and each frame is exciting and dynamic. I particularly liked the angle and depth of field that the artist has chosen in each frame. Solid and brilliant work throughout. In conclusion, I once again found myself enthralled by the latest episode of this exciting comic series. It tells a great story that shows a lot of promise to its possibilities and gives the main character Aya an extra dimension to what we saw in the game and her narrative there. Once again the mixture of fiction and truth are inventively paired together and the social ramifications are displayed here in some interesting and solid writing. I can’t seem to keep away from the assassins at the moment… and you know what? I don’t mind one bit.